In a year of incredible fights, KO's and more, these fighters are the ones who delivered most. 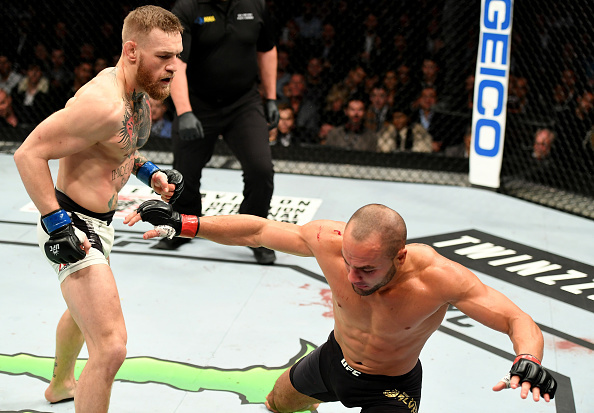 These are the best UFC fighters of 2016. British veteran Michael Bisping beat the greatest fighter of all-time - Anderson Silva – to begin the year. Then he took a short-notice fight against a champion who had submitted him already – Luke Rockhold - and knocked him out in the first round to win the middleweight title. What does “The Count” do for an encore? He avenged the worst loss of his career by beating another all-time great in Dan Henderson. Yeah, Fighter of the Year was a no-brainer in 2016. Long on the verge of challenging for a world title, Stipe Miocic cashed in his ticket in 2016, knocking out Andrei Arlovski in 54 seconds in January, and then going to Brazil to knock out Fabricio Werdum for the UFC heavyweight championship in May. And while bringing a world championship home to Cleveland was nice, successfully defending it there was even better, as he knocked out Alistair Overeem in September to make it 3-0 for the best year of his career. Dublin’s finest continued to make headlines throughout 2016, and while many focused on Conor McGregor’s larger than life persona, there is no question that when it came time to deliver in the Octagon, McGregor came up aces. Jumping up to welterweight to face Nate Diaz after a lightweight fight with Rafael Dos Anjos fell by the wayside, McGregor suffered his first UFC defeat in March, but he rebounded by winning a Fight of the Year candidate against Diaz in August, and then the featherweight champion made history by knocking out lightweight titlist Eddie Alvarez in November to become the first fighter to hold two UFC titles simultaneously. Owner of the greatest comeback story in UFC history, Dominick Cruz completed that story in January when he defeated TJ Dillashaw and regained the bantamweight title he only lost due to a series of injuries that forced the belt to be taken from him. But Cruz didn’t rest on his laurels, as he closed out his trilogy with Urijah Faber in June by winning a clear-cut decision. And his year isn’t over yet, as he will defend his crown against Cody Garbrandt at UFC 207 on Dec. 30. After dominating her first three UFC title fights against Carla Esparza, Jessica Penne and Valerie Letourneau, strawweight titleholder Joanna Jedrzejczyk got pushed pretty hard by top contenders and Claudia Gadelha and Karolina Kowalkiewicz, but like a true champion, the Polish star shook off any adversity, made the necessary adjustments and finished strong and victoriously, keeping her firmly entrenched on the pound-for-pound list. Some criticized Tyron Woodley for waiting over a year for his shot at the welterweight title, but “The Chosen One” got the last laugh at UFC 201 in July when he scored a first round knockout of Robbie Lawler. Add in his Fight of the Night draw with Stephen Thompson on the historic UFC 205 card in November, and it’s clear that it was a good year for Mr. Woodley. 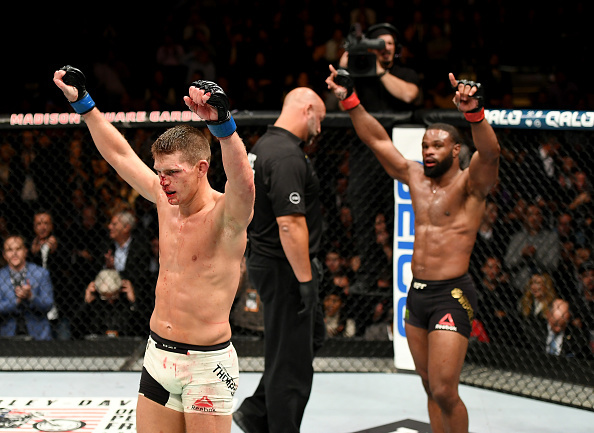 Once seen as strictly a striker, Stephen “Wonderboy” Thompson showed with 2016 victories over Johny Hendricks and Rory MacDonald that he was championship material, and after going five hard rounds with champion Tyron Woodley in November, he nearly left New York City with the 170-pound belt. In 2017, he hopes that a second shot at the champ will result in a world title. Once the quiet man of mixed martial arts, Gegard Mousasi began speaking his mind in 2016, and not only did his fans love it, but his performances in the Octagon started to speak even louder. A decision win over Thales Leites started the year off quietly, but his next three wins were knockouts, as he finished Thiago Santos, Vitor Belfort and Uriah Hall. Welterweight was supposed to be a mere pitstop for Donald Cerrone, a way to keep busy between lightweight bouts. Instead, “Cowboy” became a 170-pound contender in the space of four fights that saw him finish Alex Oliveira, Patrick Cote, Rick Story and Matt Brown in succession. Going four for four is almost a typical year for Cerrone, but 2016 took things to a new level. Sure, Derrick Lewis’ wins over Shamil Abdurakhimov and Roy Nelson weren’t his best, but “The Black Beast” did knock out Damian Grabowski and Gabriel Gonzaga impressively in his first two bouts of 2016, making it 4-0 for the year. Whatever way you slice it, that’s a year to remember, and it’s set Lewis up for some big things in the heavyweight division in 2017.